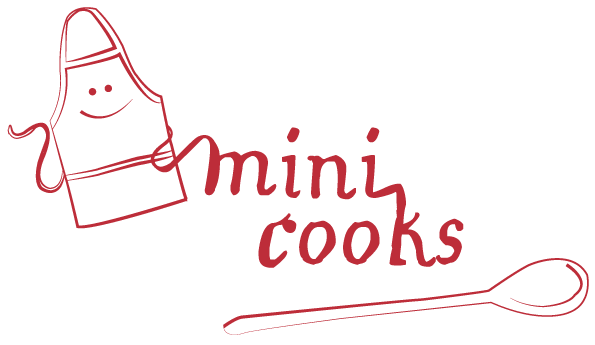 Wednesdays are always such fun around these parts with the addition of our Mini Cooks series. In our fourth week here, Joy, Sheri, and I are teaming up for lunch. And I'm delighted to share with you our version of this awesome recipe that has loads of vitamin A and vitamin C to make you feel really good about what you're adding to your children's lunches. Surprisingly, my three perceptive children have not picked up on the fact that I make smoothies every time I test out a new recipe on them. It's my fall back plan for good nutrition if the main meal ends up going south on us. I also love adding them to our lunches at home for an easy way to add extra goodness and interest to our sometimes boring lunches. 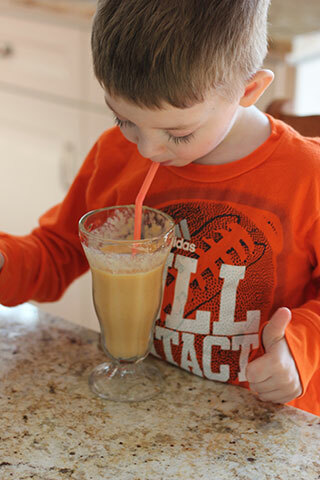 We've made smoothies from whatever we have around our house including juices, yogurts, sherbets, berries, bananas, and whatever fruits are in season or on sale in the frozen foods. This blend is extra good for us with the addition of some apple cider vinegar and soy. I enlisted my mini-est of cooks for this recipe. 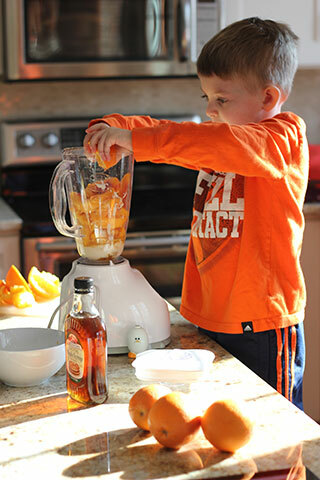 He's always excited to cook and bake with me, he loves smoothies, and he's head over heels for orange. 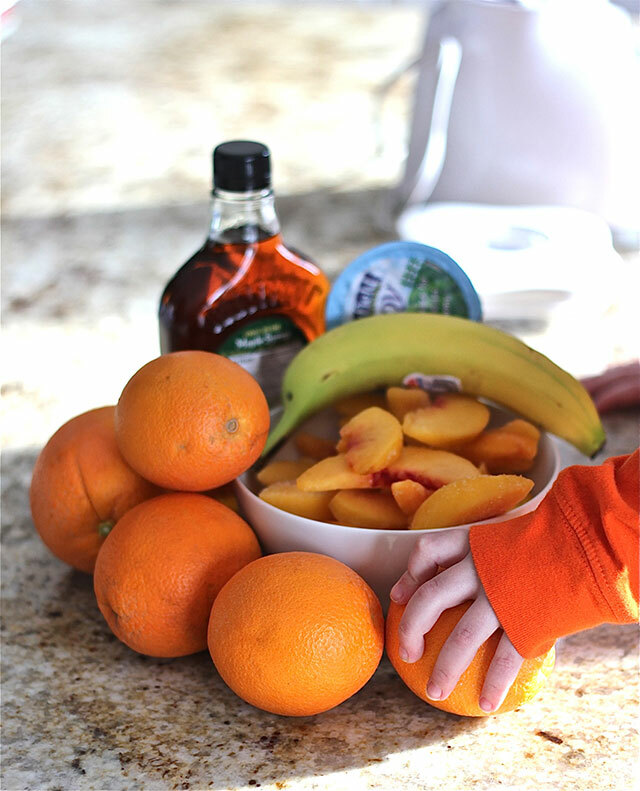 This recipe is perfect for young helpers. They can smell the maple syrup, oranges, and vinegar. They can take in the beautiful colors of the fruits. (If you're like us, without a juicer) they can squeeze the juice and pulp right from the oranges. L felt pretty powerful squishing the orange peels and seeing orange juice happen right before his eyes. We threw all of our ingredients into the blender. L is able to handle the hand mixer and toaster, but the blender just makes too much noise for his liking so I grated and liquified while he got distracted with one of his favorite household chores. This is where I just had to go with his interest and let him play. Eventually he realized that the dishes were dirtier than he really wanted to deal with, and he was ready to taste test our smoothie. His reaction? Two thumbs up, and "awesome." I'll take that. He was excited to make it for his sisters' return from school, proud of his accomplishment. And I felt good that we were all enjoying a healthy addition to lunch and snack. 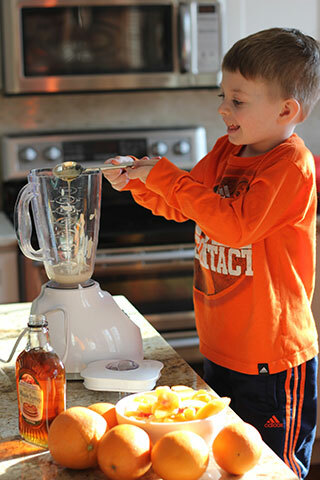 Do your mini cooks enjoy smoothies? Give them a try and don't forget to add a colorful straw! :) See more great recipes suitable for your mini cook on our Pinterest board.